Have you ever wondered what approach you need to take to become the best tennis player you can be? Are you a beginner or an experienced player who hasn't been getting the results you want? ​Then I highly recommend you check out my completely free eBook: The Building Blocks of Tennis Success. All you need to do is sign up for my Newsletter below and you will receive an invaluable guide to the fundamentals of maximizing your tennis abilities. 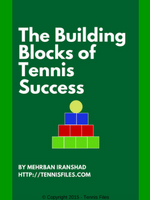 I am really excited to share The Building Blocks of Tennis Success with you. I know that your game will improve if you take the advice that I have learned from over 20 years of playing tennis, making mistakes, and learning from them. If you want to learn the right way to approach your tennis game, get a free copy of The Building Blocks of Tennis Success by entering your name and email below!